Heavy pulling, along the muddy 3 km route. Here’s an album that highlights some of the work done by volunteers and with donated funds at West Bragg Creek this summer. New trails include: Merlin View (all season), Mountain View, West Crystal re-route, Crystal Link #2, #3, #4, East Link, Bunny Loop and Chickadee Loop (XC Ski trails) and Snowy Owl and Snowy Shortcut snowshoe trails. Trail upgrades were made to East Crystal Line & Sundog (skate ski loop), West Crystal Line, Loggers Loop, Hostel Loop, East Telephone (to km 6), Snowshoe Hare and part of Demi-Tel. 7 new bridges were build (Iron Springs, lower Sundog, three on West Crystal Line, East Telephone and one on Merlin View). Plus 50 culverts were installed… some new and some larger ones to replace those that had blown out. We’ve also just ordered 100 permanent map signs (at junctions), 55 trail signs and we put up 500 snowshoe trail markers. 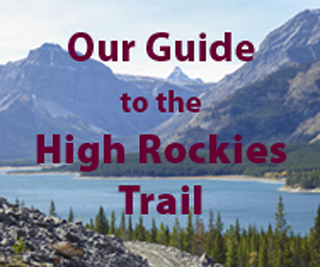 As you probably know, the Greater Bragg Creek Trails Association produced a topographical map in 2013, with all the new trails as of last fall. It also included Merlin View, which had started construction last year. So, the trails that are missing from the 2013 map include Snowy Owl and Snowy Shortcut snowshoe trails, Mountain View and some new links and re-routes in the XC ski trail network. We will be posting maps of the new snowshoe and XC ski trails on this blog site. I suggest just marking those new routes on your copy of the Bragg Creek map. It will probably be about a year before an updated version of the map will be produced. Great photos, and a lot of work, much appreciated. Where can an up-to-date map which includes the new trails be found please? Thank you.